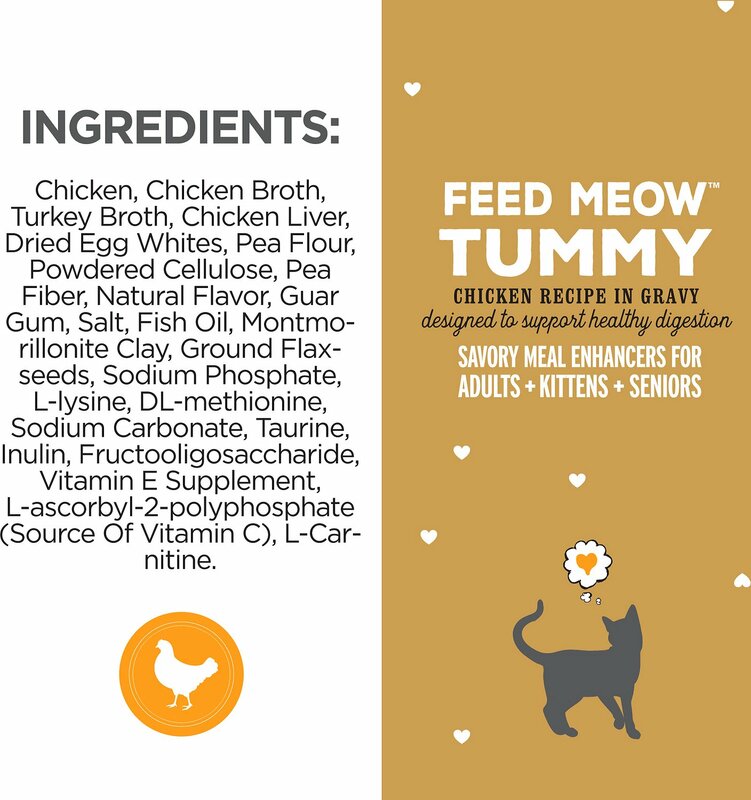 I and Love and You’s Meow Tummy Chicken Food Topper is designed to help aid your cat's digestive system. This grain-free topper is made with real chicken as the very first ingredient and contains omega-3 and omega-6 fatty acids to support healthy skin and a lustrous coat. 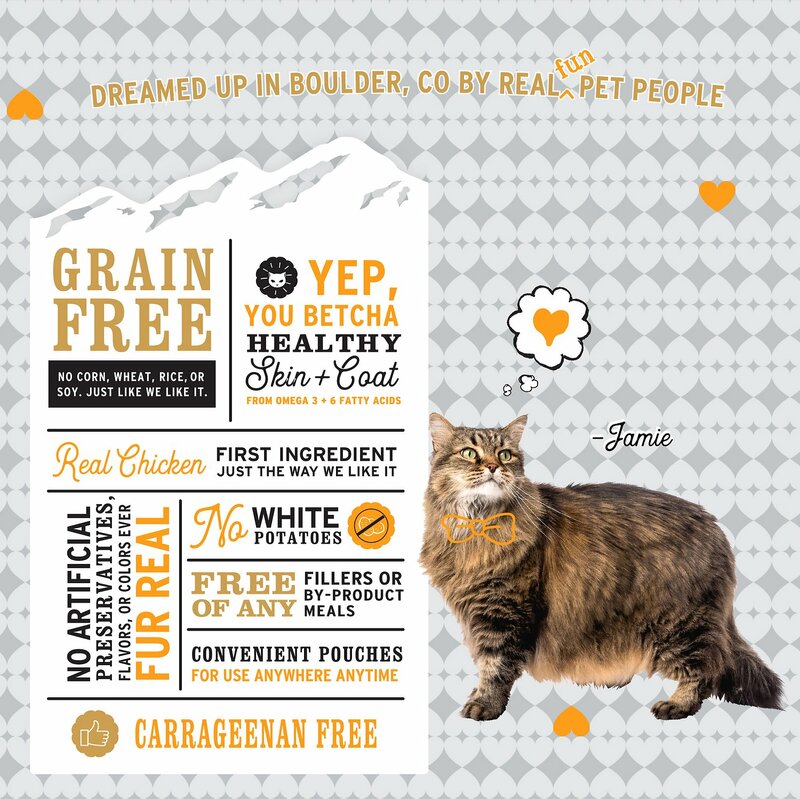 Every serving is 100% free of white potatoes, corn, wheat, rice and soy, which means it’s purr-fect for felines with dietary restrictions. 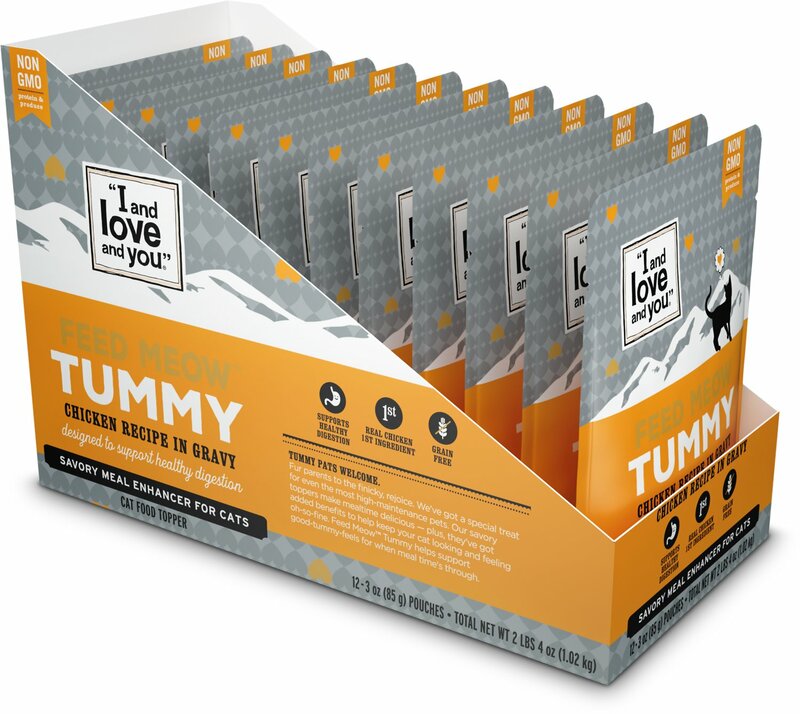 And you’ll be happy to know that each pouch is 100% free of fillers, by-product meals, artificial preservatives, flavors, colors and carrageenan. So, open a pouch and show your cat companion some love! 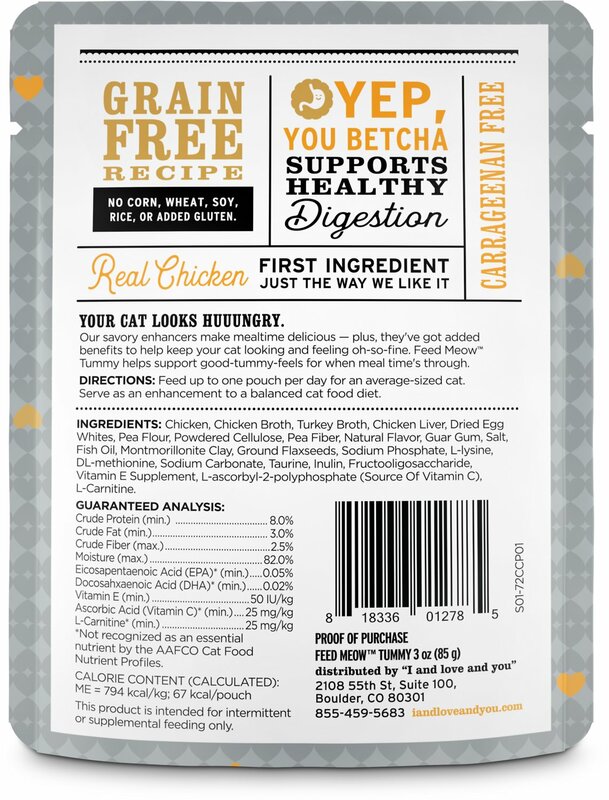 Crafted with real chicken as the #1 ingredient and a savory gravy cats love. 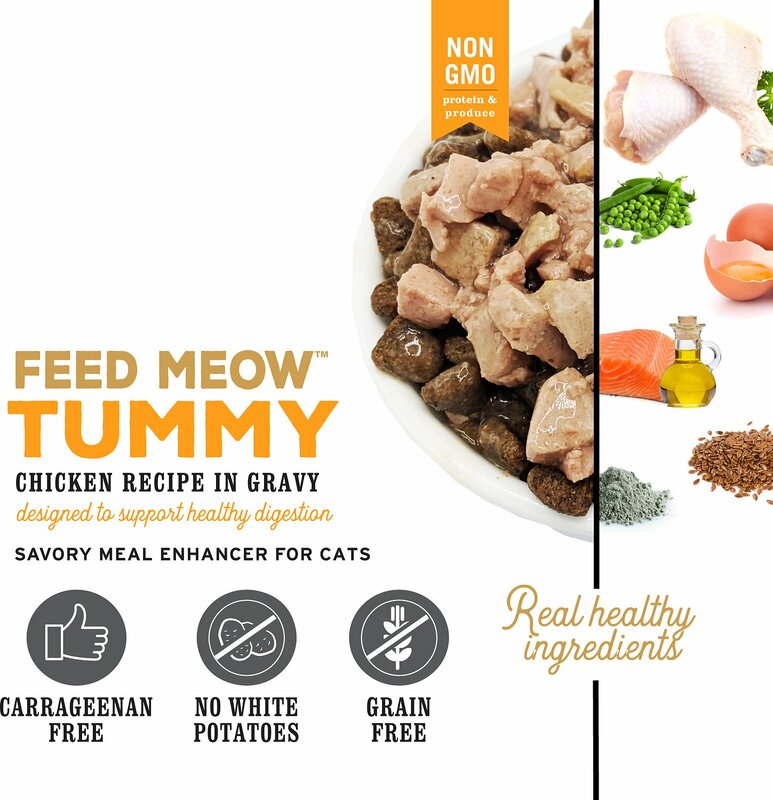 Designed to help support healthy digestion, so your feline can feel her best. 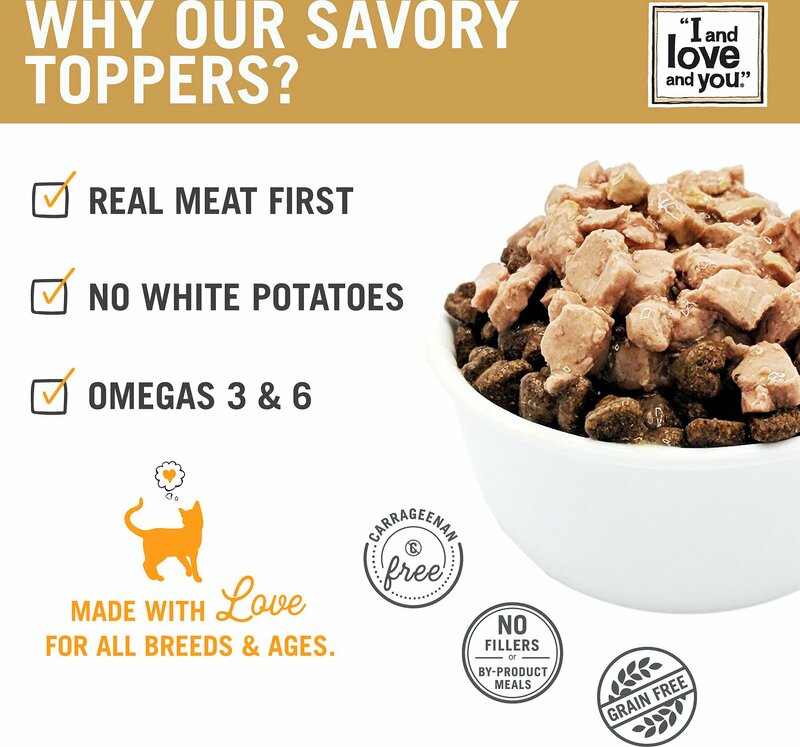 Made with zero white potatoes, rice, grains, corn, wheat or soy for a delicious recipe that even dogs with dietary restrictions can enjoy. Non-GMO protein and produce for a tasty topper you can trust. Zero fillers, by-product meals, flavors, colors, preservatives or carrageenan. Chicken, Chicken Broth, Turkey Broth, Chicken Liver, Dried Egg Whites, Pea Flour, Powdered Cellulose, Pea Fiber, Natural Flavor, Guar Gum, Salt, Fish Oil, Montmorillonite Clay, Ground Flaxseeds, Sodium Phosphate, L-Lysine, Dl-Methionine, Sodium Carbonate, Taurine, Inulin, Fructooligosaccharide, Vitamin E Supplement, L-Ascorbyl-2-Polyphosphate (Source Of Vitamin C), L-Carnitine. Feed up to 3 pouches per day for an average-sized dog. Serve as an enhancement to a balanced dog food diet. My finicky cat loves Tummy food topper! He loves the bite size pieces of real meat!